Esther, the beloved wife of the Rev. Thomas Tanfield, was born at Bradford on April 21st, 1851, and was the dutiful daughter of Francis and Bathsheba Rhodes. Both parents were consistent members of the Christian Church. From her earliest days Mrs. Tanfield was a lover of the Lord Jesus Christ, and in the days of her girlhood she yielded herself unreservedly to the claims of the Master. When she was but a mere child she regularly attended along with her mother a weekly class meeting held at the Manchester Road Primitive Methodist Chapel, Bradford. The experiences related by that little group of spiritual-minded believers made a lasting impression upon her youthful heart and helped in the formation of her beautiful Christian character. At fourteen years of age she became an active member of the Church, and remained in the closest fellowship with God’s people until her death. She was a member of the choir and sang for Jesus. She took a full share of Temperance, Band of Hope, and Sabbath School Work. 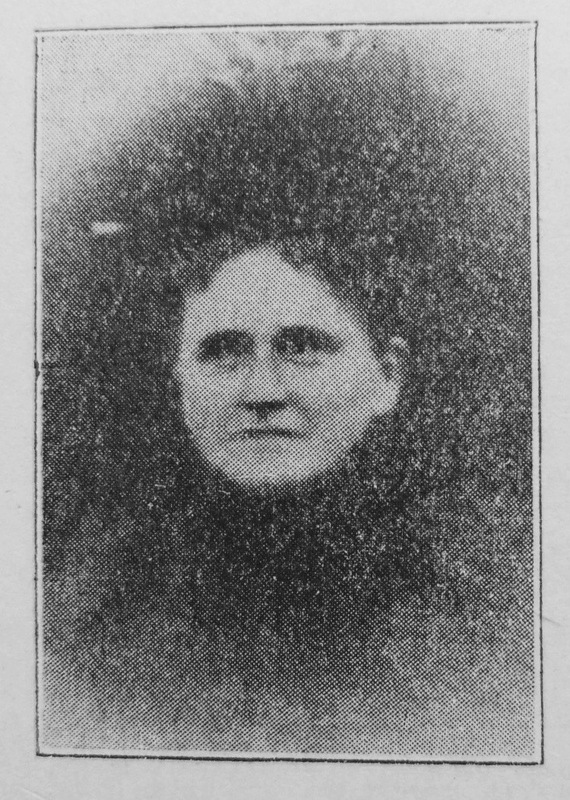 After her marriage with the Rev. Thomas Tanfield, who now mourns her loss, she entered upon a wider sphere of Christian usefulness. Unstintedly, and often at great sacrifice she consecrated her time and talents to the Masters service. She devoted her energies to the teaching of the Sabbath School, and to the training of candidates in preparatory classes for the Connexional Sunday School yearly examinations. As the result of her prayerful toil she had the delight of seeing the young people whom she had trained securing certificates and rewards. Mrs. Tanfield also was a devoted class leader and her words of counsel and encouragement will never be forgotten. She conducted mothers’ meetings and gave interesting Bible readings. The numerous letters of sympathy, written by old friends in former circuits, received by the bereaved family, bear testimony to the permanency of her work, and prove that the fruits of her toil still remain. The visitation of the sick and the sorrowing was one of the joys of her life. Many a chamber of sickness has been brightened by her cheerful presence, earnest supplications, and comforting message. In one circuit the people endearingly spoke of her as “the minister’s angel wife!” During her nearly two years’ residence at Hadnall, Salop, her affliction and physical prostration prevented her from doing so much active work as she desired, and as she had done in former circuits. In Hadnall, however, she was greatly beloved and generally esteemed by those who had the privilege of sharing her friendship. Her last illness was both protracted and painful. For many weeks during the autumn previous to her death she kept her bed, and was an acute sufferer. During the month of February, 1904, she underwent a painful operation in the Shrewsbury Infirmary. As far as her wasting physical strength would allow she conversed and read to the patients who gathered by her bedside. When she left the hospital one interested person said: “She has left a great gloom behind by her removal.” During those months of weary waiting and watching for the Master’s coming she never murmured nor complained. The long, sleepless nights were cheered with the Saviour’s presence, and were spent in communion with God. Esther’s father, Francis was a worsted weaver. Esther worked as a dressmaker prior to her marriage. Esther married Thomas Tanfield (1849-1922), a PM minister, in the summer of 1875 at Bradford, Yorkshire. Census returns identify three children.